Why is Kimura’s tale so important? Perhaps you have heard that overall average pesticide use declined by 5% between 1990 and 2003 in Organization for Economic Cooperation and Development (OECD) member countries. However, as the chart shows, trends vary dramatically in different areas of the world. There have been notable decreases in Hungary, the Netherlands, Germany and Japan, but increases across Southern Europe and in Mexico. For countries where there has been a large increase in pesticide use, the main reason has been the expansion of crop production and substitution of labour for pesticides. On the other hand, the factors behind decreases in pesticide use are diverse, ranging from declines in crop production, the rise of environmental awareness, tighter pesticide controls, to the use of new targeted pesticide products with lower doses. Sadly, however, global pesticide production continues to increase year on year. Also, quite surprisingly, the average share of agricultural land area in OECD countries under certified organic farm management is still very limited — lower than 2%. According to a report from Japan’s Ministry of Agriculture, Forestry and Fisheries (MAFF), the percentage of organic crops in Japan is very small — just 0.18% of total production in 2007. Nearly half of Japan’s farmers say they would switch to organic farming if the conditions were right, pointing out that it is not easy to convert from conventional farming to organic farming as it is much more time-consuming and costly. Farmers also complain about the lack of training available on organic farming methods. There is also an entangled relationship between farmers and the Japan Agricultural Cooperative (JA). Kazuhito Yamashita, an ex-bureaucrat from MAFF, has revealed that farmers lose support from JA and are ostracised if they don’t use pesticides and fertilizer sold by JA. For most Japanese farmers, it is almost impossible to continue doing business without JA’s support. Lately, there is apparently a segment of the JA membership who are beginning to think seriously about organic farming, so hopefully their aspirations will spread within the cooperative. Even though pesticide-free farming is thought to be possible for just about every crop, the productivity of certain plants like rice, wheat, soybeans, mandarins, oranges and daikon radish falls by 20 to 35% without pesticides. Apples have undergone numerous breeding modifications, making them particularly susceptible to disease and insects. 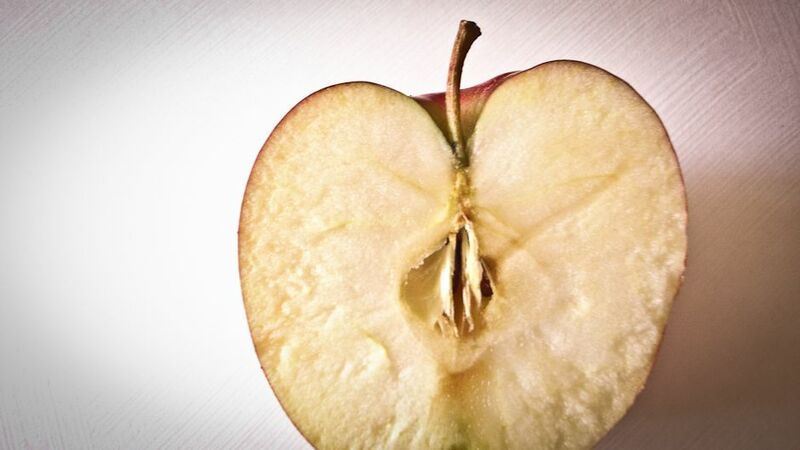 As a result, apples suffer a productivity loss of over 90% without pesticides, according to statistics by Japan Planet Protection Association. Despite these challenges, Kimura has successfully been growing pesticide and fertilizer-free apples. He began pesticide-free farming when his wife suffered from pesticide poisoning. At the start of his switch to organic methods, he suffered a major loss in income. With his business on the brink of collapse, Kimura went to the mountains, contemplating suicide. There he noticed that the wild pesticide-free oak trees were surrounded by overgrown weeds, yet they were growing well and overflowing with acorns. 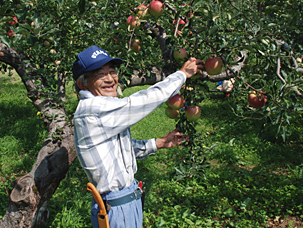 Kimura thought he could give this technique a try with his apple trees and he began working on reviving the natural ecology of his fields. Finally on the ninth spring, his apple trees blossomed again. Kimura’s fields are now overgrown with weeds and the earth is warm even when you dig deep: just like the soil in the mountains. He says his apple trees, which have deep roots, feel happy in this environment. In contrast, when Kimura was still practicing non-organic methods, the ground temperature dipped sharply just 10 cm down after the field had been sprayed with pesticides and fertilizers. Saturating fields with pesticides weakens micro-organisms and a lack of weeds disrupts the ecosystem. The more diverse weeds, the better balanced the soil. In our modern era, production rates of crops have risen sharply due to the mechanization of farming, breeding techniques, and the organization of large-scale farming operations that utilise large quantities of pesticides and fertilizers. The chemical industry spends vast sums on the research and development of pesticides and fertilizers, yet there is little being done to address the costs they bear on both human and biological ecosystems. These costs include soil exhaustion, where the overuse of fertilizers strips the soil of nutrients. In addition, many varieties of today’s agricultural produce have been deliberately modified so that it is now very difficult to grow them without pesticides. Pesticide use also has impacts on biodiversity, killing many of the bugs, good and bad, that work in tandem with our food crops. Further, when the same pesticides are used for certain periods and in certain amounts, pests develop a resistance to the chemicals and therefore a new pesticide must be developed and the vicious cycle continues. Even more worryingly, there are large stockpiles of pesticides, banned due to their effects on the body and environment, that are left abandoned and are now creating problems across the world. Despite these serious concerns, the chemical habits of the food industry continue. Considering all that is at stake, not only for farmers and the ecosystems, but for our own health too — is it not well past the time to “vote with our forks”? Quite clearly, we also need more enlightened farmers like Akinori Kimura and his Miracle Apples as strong examples of what can be achieved. Apples Have Feelings Too by Rie Hayafune is licensed under a Creative Commons Attribution-NonCommercial-ShareAlike 3.0 Unported License. Engaged as an assistant and writer for the UNU Media Studio, Rie is interested in how business and environmental issues interact. She studied International Affairs and formerly worked in the financial field. How Much Oil Do Americans Eat? Well, Kimura have done a great thing.Let every farmer in the world adopt such technique to save our earth from destruction. I am from India which is a developing country with 2nd largest population in the world.If there is no pesticide there may be food crisis arising in our country.But the non-technical usage to these dangerous pesticides have made many farmers cancer patient. What will be the effect of Pesticides on human life? How long will human being able to survive the the effects of pesticides? A great discovery. I normally wash my fruits to clean off all the dreaded pesticides. I do hope this concept is taken up by more, then may be one day, I will only to wash my fruits to clean it from dirt. You can’t wash pesticides off. If they are used, they are an integral part of any crop. I have worked for a pesticide spraying service. I know there are still a few pesticides around that are not good for you but to be fair there are quite a few out that are more effective than ever and are harmless. We used an insecticide made from a flower that had a 3 month residual effect and absolutely no adverse effects to mammals, fish, reptiles or birds. This pesticide is expensive though, and because of that most farms do not use it. Not all pesticides are bad. I get really sick of hearing this when it simply is not true. I’m not all about the organic stuff. I guess I can see why someone would eat organic produce, but crackers and chips and whatever else is just ridiculous, and a ploy to charge more for products because they know there are crazy irrational people who will only buy “organic” stuff, no matter what it is or how much it cost. I know 3 very good doctors and am in medical school myself. None of them eat organic food. One of them, who has 19 years of schooling and several different specialties explained quite a bit about all of this to me. I already knew some about pesticides, but he went deeper into what is used and how it effects your body and so on. Have a good time spending gobs of money on all of this crap. RNP: Sure there’re a few natural pesticides (like pyrethrum, which is the “made from a flower” one you are probably referring to, however it’s interesting that someone who claims to be so knowlegeable seems to lack simple terms & details!) Anyway, go ahead and believe everything your friends tell you and just keep chugging all the chemicals you want! Those less gullible might be interested to know that the World Health Organization estimates that each year, 3 million workers in agriculture in the developing world experience severe poisoning from pesticides, about 18,000 of whom die! That it is that type of stuff that’s sprayed all over most of the world’s food! Fine, here in the rich world, the chemicals used may be slightly less toxic (to our current knowledge, which is highly likely to change!) However, if you bothered to educate yourself at all (where is the rock you live under anyway? ), there is a TON of research on the health & environmental effects. Everything from cancer to birth defects to Parkinson’s disease and the recent disappearance of the world’s bees. So in fact, what is “crazy and irrational” is the fact that “very good doctors” and medical students are so seriously in denial that it’s likely that the rest of us will be stuck involuntarily imbibing your chemical crap for a very long time to come. Uggh, how frustrating! Thanks for your comments. Would you be so kind as to mention the pesticides that you consider harmless. That way other readers can google them and check for themselves. Also, to eat organic or not, should be really a personal choice. People should have that choice, don’t you think? In the case of Kimura, he believes that his wife was sick as a result of the pesticides. When he stopped using them, she got better. So in his case, it is true that pesticides were the problem. But it would be really useful if you could point to those pesticides that are not harmful. Just let there be no misunderstanding. Mr. Kimura is not completely against pesticides. But he thinks farmers are using too much, and suggests trying to use less. If it’s possible, both farmers and consumers would be happy. The problem is that we do not design our farms and gardens in a way that takes advantage of nature’s ability to self maintain crops and utilize natural energy flows. Yes, we can mimic natural ecosystems while increasing yields and decreasing inputs. If we provide predator habitat and food, for example, pests are NOT a problem. I have seen this time and time again. Providing the needs for a balanced ecosystem does not have to, in any way cut down on yields. Whether the farm is “certified organic” or not has nothing to do with it. If we design our farms correctly, using tried and tested ecological principles (e.g. permaculture principles work wonderfully) we can cut down on input costs, and create a more resilient food producing ecosystem. Example: pests have faster lifecycles than predators, so in order to get a balanced population of pests (which are necessary in small amounts, because when they bite our plants, for example, it triggers the release of certain defensive chemicals that are highly anti-cancer and important for us to consume), we have to stop spraying chemicals that kill the predators and prevent them from building healthy populations. The soil ecology is a whole other story, and pesticides, fungicides, herbicides and fertilizers dramatically screw up the soil food web, which leads to lower nutrient holding capacity and water holding capacity, among many other things. I am a practicing farmer and gardener, in urban and rural areas, and also a farm and garden designer. I’ve been studying advanced agricultural methods for the past five years via university programs and various courses, as well as via mentors with decades of experience. I and currently working on my Masters with a focus on large scale farm design and eco-social design. I have seen countless examples of people who are not only NOT using pesticides and fertilizers, but in these situations, yields can actually increase. Yes, with conventional organic methods yields fall. The problem is, as I mentioned above, that our farms are not DESIGNED. We now have design technologies from the fields of permaculture and agroforestry, alley cropping, and natural farming, that do in fact allow us to get higher yields out of the land. There is ample evidence that shows yield increases with the use of wind breaks, and nitrogen fixing perennials (why not use clover and alfalfa, and other plants that perform various other functions in orchards instead of GRASS for example, which is NOT good for trees), to name a couple. Bottom line: pre-industrial agriculture was labour intensive, industrial agriculture is energy intensive, and the agriculture of the future is DESIGN and information intensive (ecological design using ecological principles, since a farm or garden is an ecology). If we want to grow food, we must focus on learning more advanced design technologies and acquaint ourselves with what is already going on in permaculture, agroforestry, alley cropping, silvopasture, and other fields of ecological design. Yes, and so to say all the worlds food production is oil dependent. In other words: No oil, no food. We have to do something about this, and Kimuras methods have to be utilized across the planet. Mr Kimura’s apple is very sweet. It is very sweeter than the other apples. And the apple of Kimura does not rot. I wanna eat natural sweet apple than the apple with pesticide. Yes, we can make low pesticide. But Nobody can make it like an apple of Kimura deliciously. Only natural can make sweetest apple. Mr. Kimura’s method seems to echo that of Fukuoka Masanobu Sensei and the no-till cultivation that he developed. You can find out more about this on the Internet. successfully been growing pesticide and fertilizer-free apples. and switch to organic farming. One pioneering organic apple grower, Akinori Kimura, has proven that we do not need pesticides. In Organization For Economic Cooperation and Development (OFEC) member countries, overall average pesticides use declined by 5 % between 1990 and 2003. However, there have been a large increase in pesticides use in some countries because of the expansion of crop production and substitution of labor for pesticides. According to a report from Japan’s Ministry of Agriculture, Forestry and Fisheries (MAFF), the percentage of organic crops in Japan is very small. Many farmers insist that it is not easy to change their farming for many reasons such as cost and time. In addition, pesticides are very harmful on our body and environment. 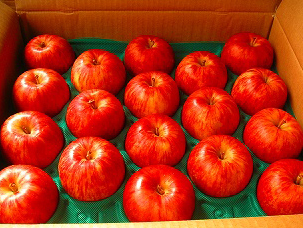 Despite these opinions, Kimura has been growing pesticide-free apples which are called “Miracle Apple”. He began pesticide-free farming when his wife suffered from pesticide poisoning. At the start of his switch to organic methods, he suffered a major loss in income. But, he didn’t give up and finally he succeeded in making pesticide- free apples on the ninth spring again. In conclusion, we need more enlightened farmers like him and to know how to live in a way that is supportive on earth. I missed this wonderful article when it first posted last year, and only came across it last night on Yoko Ono’s blogroll, of all places. Yoko Ono’s site is featuring an English translation of a book about Kimura-san, and it is a very engaging read, highly recommended, but you have to be patient as it is being posted one chapter per week, and we are currently at 17 of 24 chapters. Thank you, Yoko, for your generous efforts to make it available to us. ‘Do-Nothing’ does not mean that founders actually do nothing, but rather that they recognize that everything they need is right in front of them, and they begin without seeking external inputs. A social entrepreneur is fundamentally engaged with re-writing the social contract in a compelling way such that their solution or innovation self-organizes toward efficiency and scale by making use of the preexisting elements and energy of society. They nurture an ecosystem larger than themselves or their own venture to allow many-to-many producer-consumer relationships to propagate the idea, rather than attempting to setup a top-down one-to-many system where everything is centrally controlled. We are very much moving toward a recognition that wisdom is what is at risk in our modern world. We can deploy endless amounts of technology but without wisdom to apply it we end up exactly where we are – on the edge of a civilizational abyss. Kimura-san and Fukuoka-san recognized, stubbornly, that the simplicity on the other side of complexity is worth the high price they paid to find it. Ultimately, I believe we’re all destined to come to these simple truths sooner or later – and later is at our extreme peril. At the beginning of this article, the writer asks us, “Do we really need to use pesticides to grow crops?” There is a pioneering organic apple grower, Akinori Kimura, who has proven that we do not need them in Aomori, Japan, and are lots of visitors who are interested in learning his secrets coming to his farm. And actually, the overall average pesticide use declined by 5% between 1990 and 2003 in OECD member countries. Especially, there have been notable decreases in Hungary, the Netherlands, Germany, and Japan. On the other hand, looking at the number of global pesticide productions around the world, it continues to increase year on year. And almost half of the Japanese farmers tell indirectly that it is not easy to convert from conventional farming to organic farming due to the time-consuming, the cost, and the lack of training for converting. Speaking of the cost, the Japanese farmers get supports from Japan Agricultural Cooperative (JA). However, they give them for just the farmers who use pesticides and fertilizer that are sold by them. Why Kimura started growing the organic apples is because his wife suffered from pesticide poisoning in the past; but the way to find the successful methods of growing them were too steep. He has thought about suicide once. However, he finally found the great and successful methods of it. As a conclusion, I want to say that unfortunately there are people who are suffering from pesticide poisoning in the world so the governments of every country should think about it and how to make the farmers available to grow organic crops. Another article that promotes ‘feel good’ Edenistic concepts of pure food production, using organic or methods of sustainability, without any supporting data. Please…for the sake of real education…show us some factual evidence of the environmental dynamics that give rise to an environmental shift, not the dogma that we have been hearing for the past 30 years on soil warming. Certianly increased soil health is vital in all agricultural systems; But…. How about some critical thinking based on site observations, the backbone of basic science, that support the change Akinori Kimura observed. So supposedly, after 9 years, allowing the tree to exist in a ‘diverse ecological system’ promoted what Akinori and followers call the Miracle Apple. In the Northeastern US, we have cultivated apple that have been left to the wild for 50 years, and every few years they have fruit. Every agriculturalist knows the cycles that occur in nature…Simply…every 10 years or so environmental conditions favor low populations of insects or low incidence of disease due to shifting weather patterns, drought that reduces disease, heat that kill insect larvae, heavy rains that wash off insects from the foliage and fruit or increase entomophagous disease during early larval development. see yield reduced by 50-90% in any given year…yes, they too can produce one nice looking box of fruit as shown in the photo, but not an economically viable crop, and without a doubt, be forced to charge high prices for their crops…yet not afford to stay in business. Do the science, replicate the data over time and see what you have after 4 years of analysis. Then produce the article that is peer reviewed and of REAL value to the non-agricultural and AG community so we can all learn something of value…not simply wag the finger at the farmers while enjoying the fruit from Chile or Washington State where they grow fruit in desert climates using billions of gallons of irrigation water from the Colorado river. why organic farming does not favor insect population ?